In the absence of the typical post-game breakdowns from the past week, it seemed best to lump everything together as the Sabres have embarked on a course of failure in virtually every aspect of the game. As the team’s anemic attack continues on their trend of truly becoming One Buffalo, the goaltenders have been left in the precarious position of attempting to keep the ship afloat. As the last week of games has shown, Buffalo’s tandem hasn’t been able to provide the goaltending needed – read: shutouts – to steal points on a nightly basis. The Sabres incredible inability to score goals has left them wallowing as they’re left expecting perfect goaltending in order to win games. Buffalo have scored 10 goals in eight November games (1.25 goals per game average) and are averaging exactly one per game over this five game losing streak. That leaves each goaltender with a monumental task of trying to pitch a shutout nearly every night. While both have played well, it hasn’t been well enough to lift the struggling forward and defense groups. So what has worked? What hasn’t? Both goaltenders continue to do a very good job of playing to their size and presenting big targets in the crease. I’ve also been very impressed with their anticipatory play, especially Robin Lehner’s. I suspect this has more to do with the hobbled blueline corps than anything else, but Lehner has faced an onslaught of odd-man rushes over the past week. Two of New Jersey’s goals came on odd-man opportunities and the Blues and Senators enjoyed a number themselves. While Lehner was victimized badly against New Jersey, he was beaten by a number of perfect shots despite making the correct, early read on each play. That carried over to St. Louis on Tuesday as he did a terrific job thwarting a well executed two-on-one. As Cody Franson attacked the puck carrier with little backside support, you can see Lehner beginning to cheat to the center of the net. He’s opening up his chest and pads to get across the crease in the event of a pass. 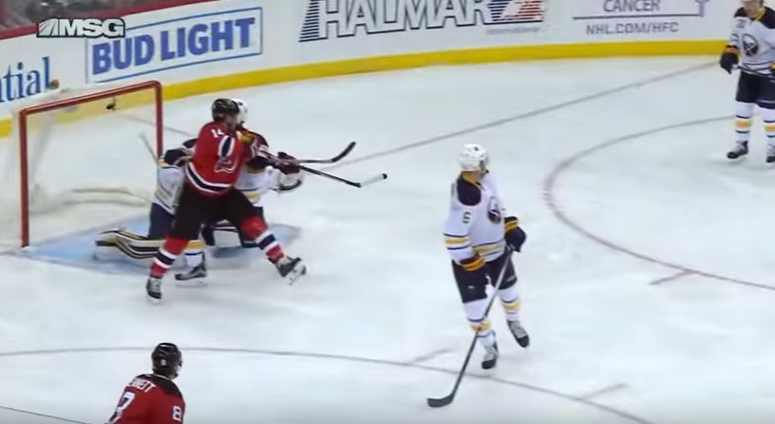 The pass comes and Lehner is still respecting the shooter just enough to not be caught cheating. His chest and legs are still opening to the slot while he’s doing a good job holding the short side as Franson attempts to shut the play down. 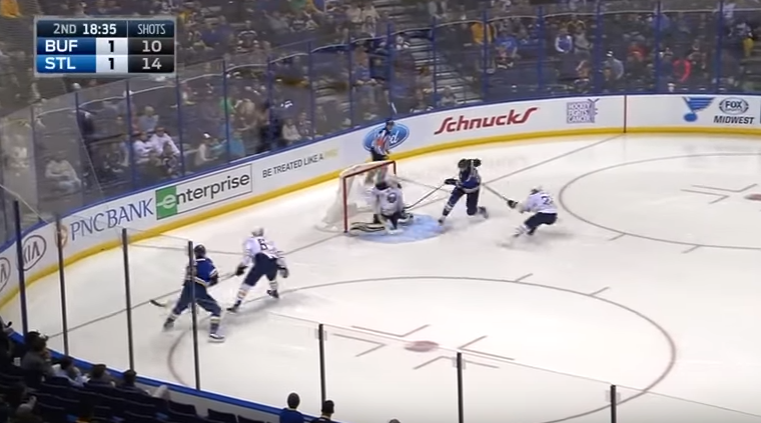 Not only is it obvious that Lehner is aware of the threat in the slot, he’s doing a good job reading his defender here as he knows Franson is in good enough position to prevent a shot from the shortside, giving Lehner the ability to take a head start moving across the crease. The save is made in a good, upright position that keeps Lehner alive in the event of an inevitable rebound. 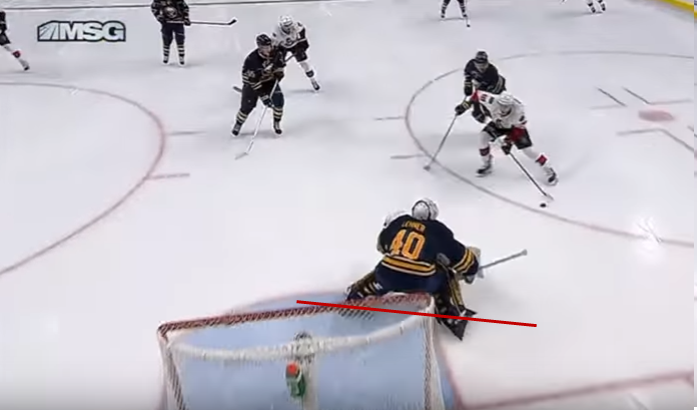 The puck eventually moves below the goal line on the left side of the net and Lehner is able to stay in the play effectively, as testament to the read he made on the initial pass. Anders Nilsson has continued to impress as well. He was terrific against the Devils and probably deserved a better fate than a questionable overtime penalty shot winner. His second period save on Taylor Hall stood out to me for a few reasons. First, Nilsson stays well out of the net to cut down the angle. Second, he moves very well as Hall changes the angle on the shot as he enters the zone. Third, he stays big as he challenges the shooter, using his frame to his advantage. 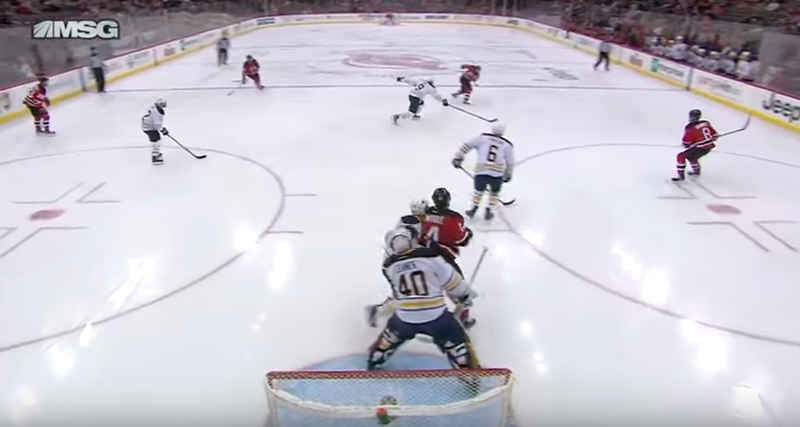 It’s hard to make out on the video as the camera follows Hall for the most part, but Lehner shuffles across the top of the crease as Hall moves left to right in the slot. The change in angle forces Nilsson to stay active as Hall shoots on the move from just inside the circle. Nilsson’s movement and positioning in the crease eventually lead to a relatively easy save, although the technique required was quite impressive. It hasn’t been all good for the pair, of course. Lehner was roasted by the Bruins thanks to an ill-disciplined team in front of him and the Devils rang up three top-shelf tallies in their 4-2 win. Take Kyle Quincey’s goal which beat Lehner high glove and through three bodies. One area I think Lehner has needed to clean up are the leaky goals he’s allowed. David Krejci’s powerplay tally in Boston beat Lehner under the arm as did Matt Dzingel’s pretty goal at Key Bank Center. Dzingel’s goal came thanks to some questionable defending and a shot that you probably want stopped most of the time. 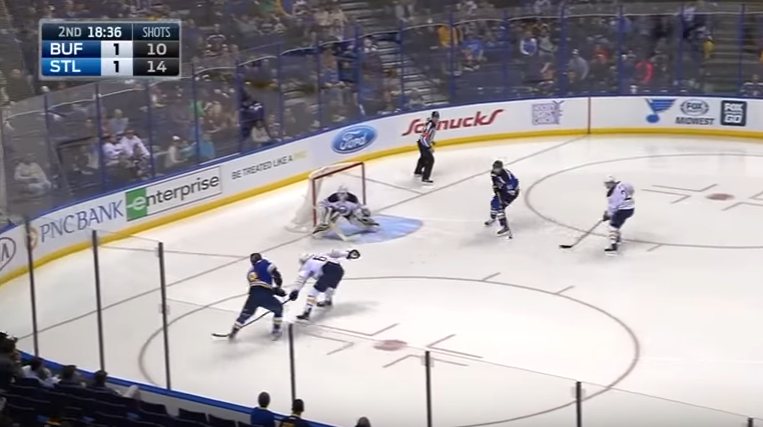 As you can see, this play got away from Kulikov and Ristolainen quickly. As a result, Dzingel goes from a non-threat to a breakaway in very short order. Lehner plays this properly, getting to the top of the paint as the forward collects the loose puck. The issue at hand for Lehner is that Dzingel is a threat to shoot or deke here as Kulikov hasn’t turned yet and there’s plenty of space in the slot for the Sens forward to push to. So, Lehner is stuck respecting the threat of a forehand-backhand deke. 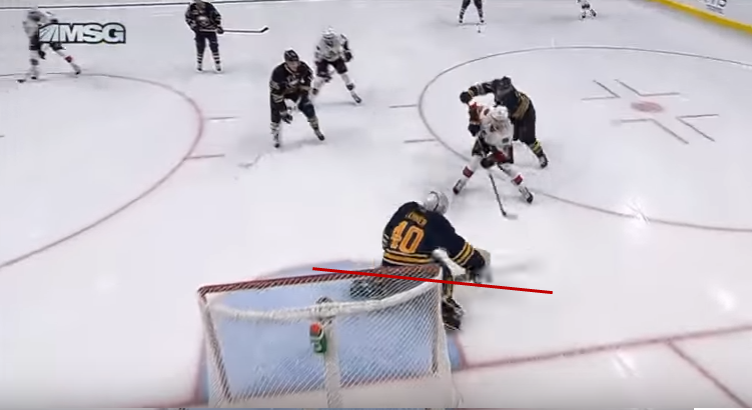 Even here, the instant before Dzingel shoots, he’s still a threat to pull the puck across the face of the goal and it’s likely that Lehner is considering that possibility. While the stick is opening far more than it did the frame before, there’s still that possibility. 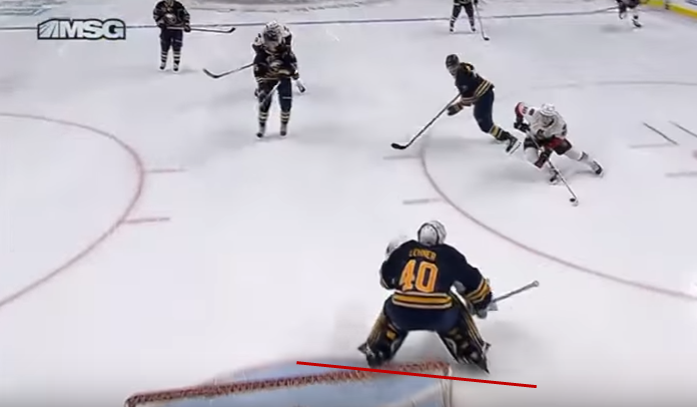 However, as the threat of a deke is decreasing frame-by-frame, you see Lehner holding his ground for the most part. He only winds up retreating ever so much as the puck nears the crease as this is ultimately a scenario where a shot will come over a deke. You can see by where his feet start and where they end up that he does a good job challenging. He ends up being beaten under his arm, an unfortunate development as he did a pretty good job playing the shooter. 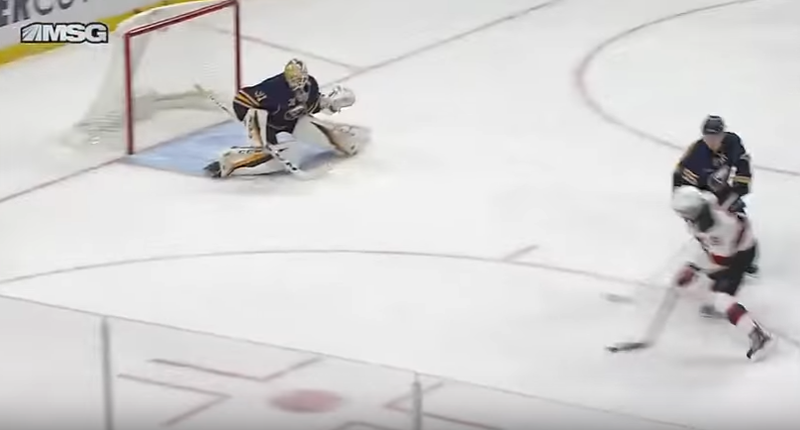 It’s certainly a save you want to see made – and this version of the Sabres need that save made since they can’t score – but it’s certainly not a weak goal either. 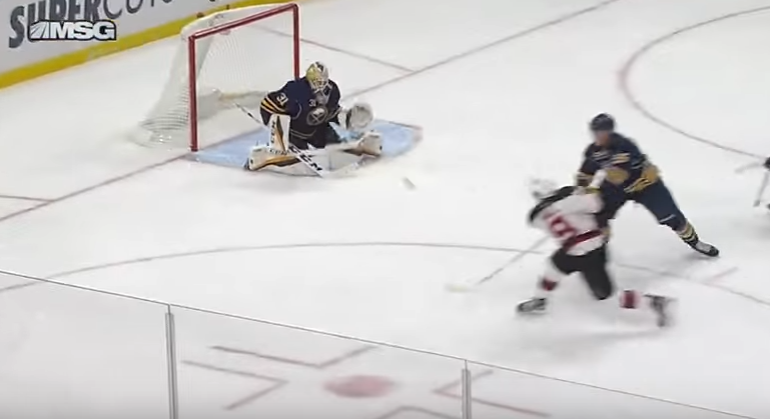 I saw some criticism of this goal as one Lehner misplayed. I disagree with that assertion. 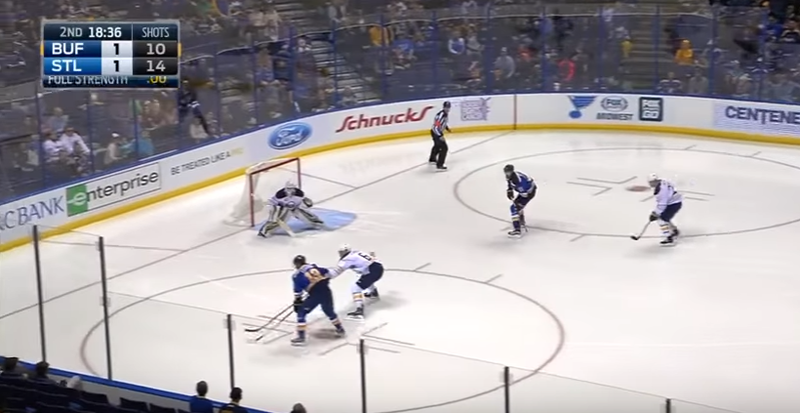 He couldn’t overplay the short side and leave himself fully exposed to a deke – not unlike the first St. Louis goal on Tuesday. Ultimately you want to see the shot stopped as it sneaks through his body mass. The same goes for Krejci’s goal in Boston and the trickler that beat him in New Jersey despite a very good read. All of this is compounded by the lack of offense in front off each netminder. Lehner’s goals against average will take a hit after the last two games, but they haven’t been four-goal outings that you look at and think how doomed the team is in the crease. Many of the goals he’s been beaten on lately are either odd man rushes or plays that develop in a way that it’s impossible to come up with a save. It’s an unfair position to put any goaltender in and the Sabres are paying the price as a result.